The Home of Strings Association invites you to an extraordinary Concert, an opportunity to celebrate classical music. The organization promotes classical music and young soloists, giving them the chance to assert themselves and build their way to the great scenes. 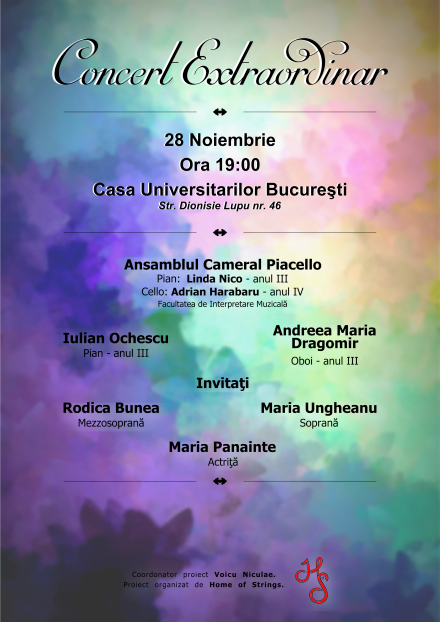 So, Friday, November 28, at 19:00 at the University House-Dionisie Lupu, Nr. 46 You are invited and long awaited. As I have accustomed you to the events promoted on this blog, the entrance is free! More details about the concerts of the month Noimebrie and December 2014 organized and supported by this organization find On their website.